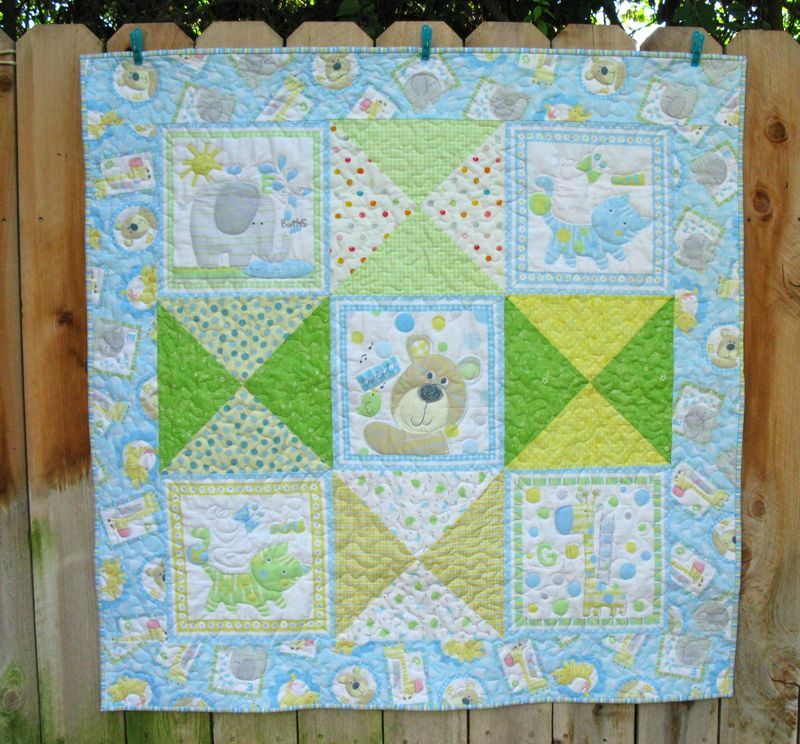 This and That and a New Baby | OccasionalPiece--Quilt! 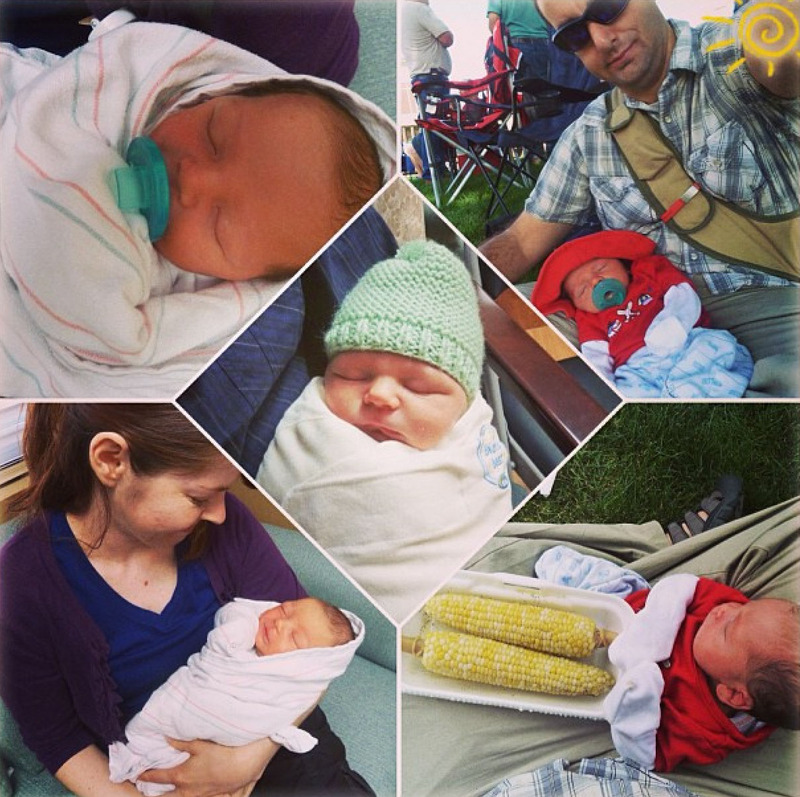 Posted on August 7, 2013 by Elizabeth E.
While the rest of us have been having a summer, my son and his wife have been having a baby: they flew to Iowa (sweet corn country) to pick up their newest son, making four in that family, and number eleven grandchild for me. 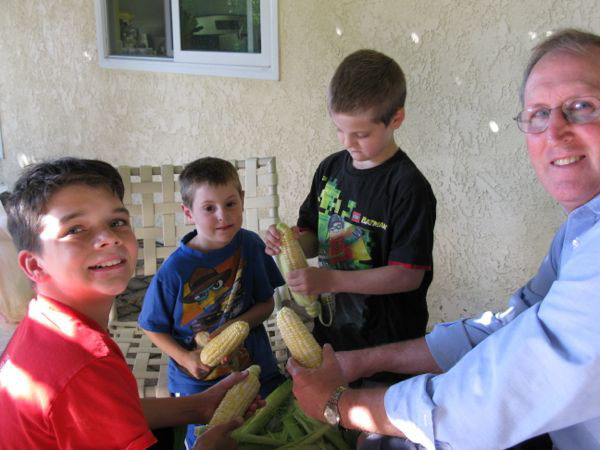 We had the older boys stay at our house, and here they are doing a little corn shucking of their own with grandpa. Somewhere in here, I finished the quilt for Charlie, this newest grandson. 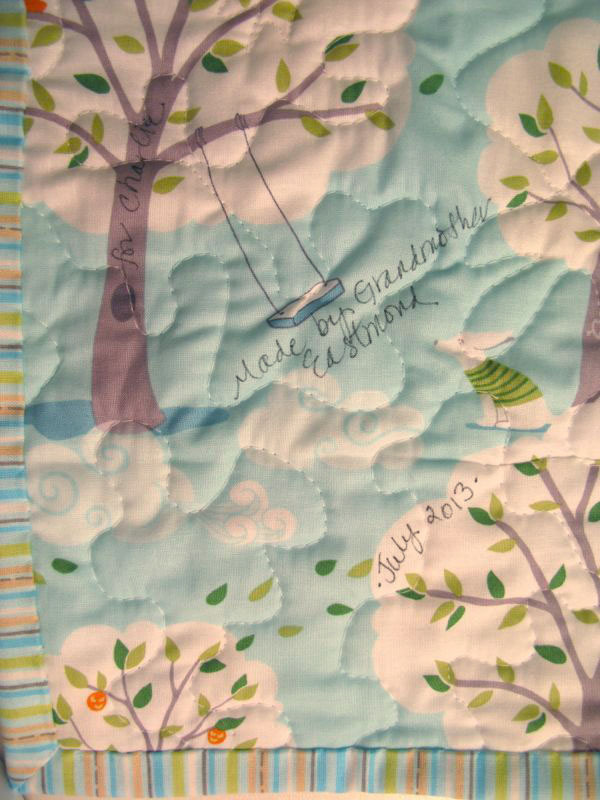 I love love the back of this fabric: Backyard Baby, and so instead of a formal label, I scattered the information within the breezy trees. (That little white dog, with its ears blowing backwards, cracks me up every time I look at it.) While I finished it up a couple of days ago, I’ve learned to write the birth month on the quilt. This is quilt #120 on my 200 Quilts list. 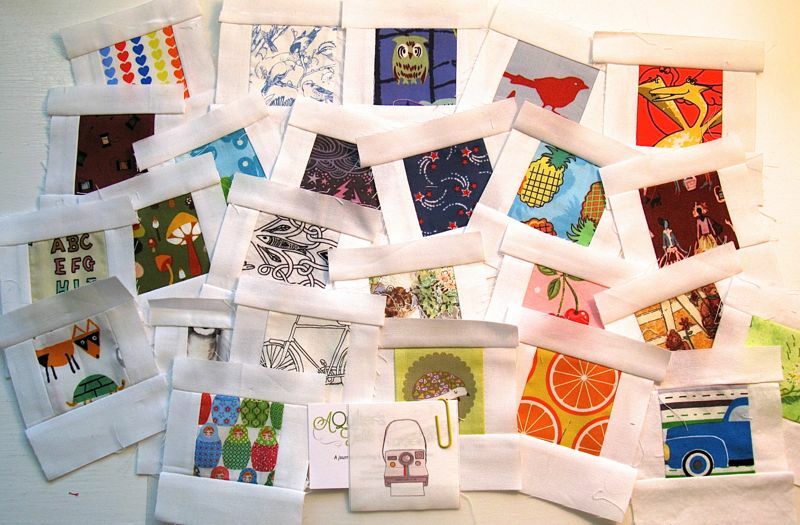 Kris, of Duke Says Sew What, is doing another Polaroid Swap, if you want to join in. I’m slow to post this, so hurry over to her blog and leave a comment to let her know you are participating; you have until August 26th to mail in your blocks (domestic — the international mail-in deadline is a bit earlier). I attended the Long Beach Quilt Show last weekend and picked up a couple of fun things to giveaway to my readers and followers, knowing that the end of summer is coming and we can’t say good-bye to its crazy days without a little fun. 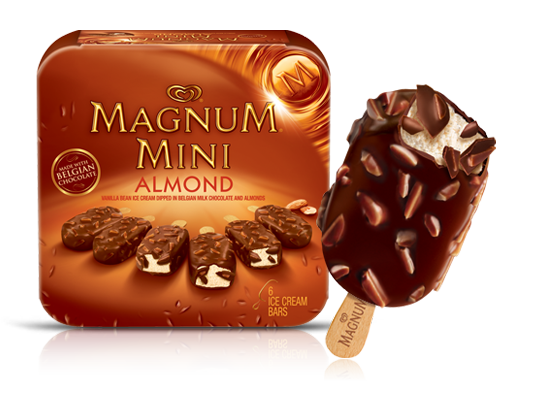 Giveaways (I have more than one!) will be posted at the end of this week, and I’ll pick my winners next Monday, the 12th. Have a nice end to your summer! How wonderful! Have they adopted other children? Bless them for giving this wee one a home. Your quilt is darling and I do love the backing. Congratulations to you on the new addition to your family. Grandchildren are such a blessing. Beautiful quilt! 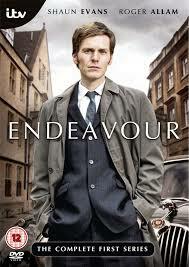 Endeavour is a favorite of mine along with anything else Masterpiece Theater! Ahhhh…..congratulations to all. He is such a cutie. Your quilt is darling too. I do love that fabric. It will be put to great use with that wee one. Summer has gone by much too quickly for my likes. That quilt is so very, very sweet! Your new grandson is even sweeter! Wow, 11!! That is such a blessing. Congrats to the entire family! Beautiful addition to your lovely family!!! Your quilt is over sweet, thanks for sharing! What a sweetie! I want to hold him. Hooray for new babies! 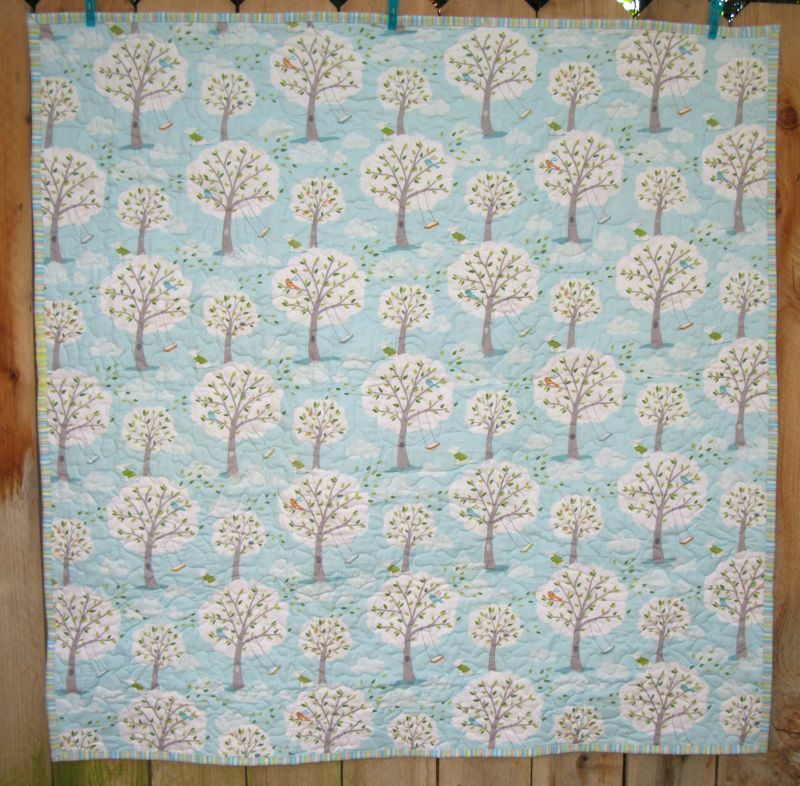 I love the “windy day” backing fabric, even though I dislike windy days in real life! What a beautiful baby, and such a lovely quilt to wrap him in. Nice to know he’ll be protected from the “storms” of life! Congratulations on the newest addition….what a fun family he gets to belong to! Congratulations! Lovely baby, lovely family, and lovely quilt! 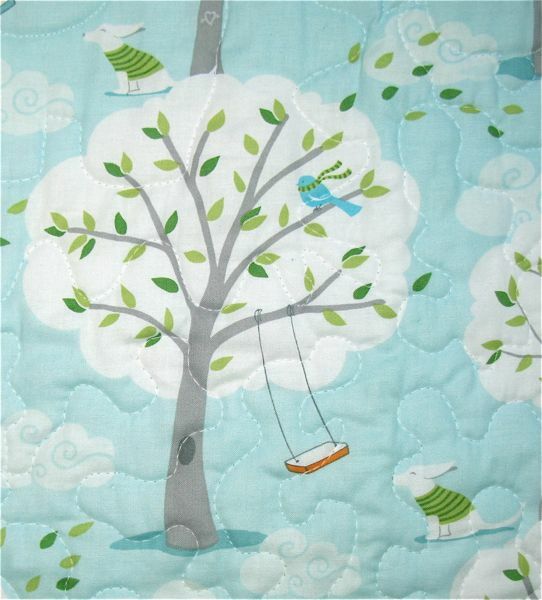 That “Backyard Baby” fabric, quilt and new grandson are adorable! Congratulations all round! What a beautiful baby! I love how you labeled your quilt. And I really want some of that fabric, which I had never seen before. Isn’t it great when your friends make you aware of things you didn’t even know you needed?! Congratulations to all on the new addition to your family! Beautiful quilt and Ilove that little dog, too! What type of pen do you use to label your quilt like this? It looks great. Thanks for the shout out to my Polaroid Swap. :-). Your swap idea was contagious! I love the fabric you used for the back of Charlie’s quilt – and what a great idea to write on the fabric itself rather than making a label! Congratulations, how wonderful to have a new baby, and a new grandbaby! Your little quilt is very cute too. Pingback: Finish-A-Long, Q3 Wrap-Up and Quarter 4 Goals | OccasionalPiece--Quilt!